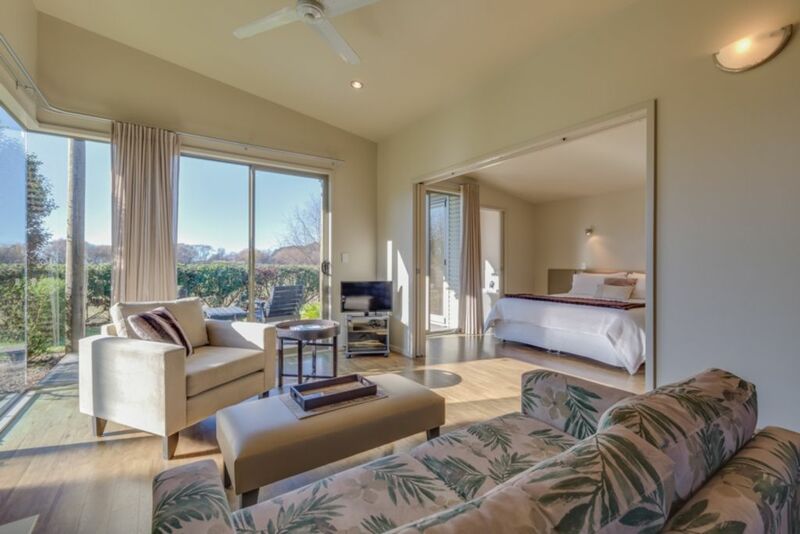 Gateway to Cape Kidnappers, these two charming Cottages are situated in a picturesque coastal setting within walking/cycling distance to beaches, wine-tasting, bird-watching, ocean activities, and artist community. Only 15-20 minute scenic drive to Art Deco Napier and Hip Havelock North. Cycle and walking paths to Clive, Clifton Beach and Cafe. Local wineries with restaurants - Clearview Estate and Elephant Hill Winery. Great half day visits to Cape Kidnappers Golf Course, Tuki Tuki River, Ocean Beach, Waimarama Beach, Te Mata Peak, and 30+ wineries. Visit Gannets (big bird colony at the Cape) via tractor rides on beach, guided treks, overland safaris or beach walk. Both architecturally-designed Cottages feature views of the surrounding hills, lush interior furnishings (including a bath with outdoor viewing) and partially enclosed decks. Enjoy the sun rising and setting with a cup of coffee or a glass of wine. Bring your boat, golf clubs, bikes (or hire one of ours! ), fishing poles or travel light and relax on-site with a book! Three night minimum holiday and special event weekends, peak price for three nights. Available for hire per person per day. Amazing spot for a getaway! Amazing spot for a getaway! Just beautiful! We stayed at the cottage for our wedding. The cottage was secluded, peaceful, clean, and tastefully furnished. We had everything we needed and lots of space. I would love to stay there again and I would highly recommend it. We loved the comfortable bed and well equipped house - especially kitchen! It had every utensil you could want during a short stay. It felt private and quiet despite being just off the road. We thoroughly enjoyed our stay.